With the winter months fading behind us, the weather improving, the days growing longer, I notice a change in my movie habits. I cannot prove it, nor really articulate it, but certain movies become mainstays for me during the warmer months. Readers of this blog may recall a series I did last autumn in which I discussed some of my favorite horror films for that season. For the spring, and leading into the summer, I will do the same. However, rather than focus on a few films in a sub-genre of horror, this time I will look at various films across different genres and explain why they resonate with this time of year. I hope that some of you will learn about movies you have not seen before. Really, my goal here (beyond discussing some of my favorite spring/summer time films), is to introduce people to new movies. With that in mind, I want to turn to the first category, Comedy. Directed by Joe Dante and starring Tom Hanks, Bruce Dern, Rick Ducommun, and Carrie Fisher, this 1989 Universal Studios comedy/mystery/suspense film holds a special status for me personally. 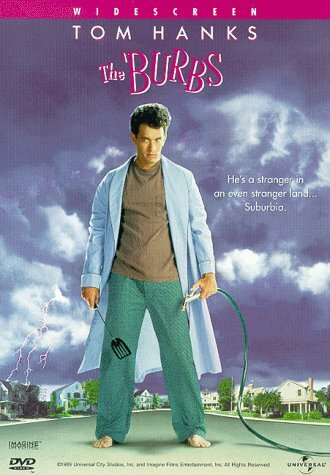 I consider The Burbs to be my all-time favorite comedy movie. For me personally, everything just works right with this movie. So unfortunately, if I ever do a top 10 of my favorite comedy films, I have already spoiled number one. So what makes this movie as great as it is? The Burbs involves three neighbors who live on a cul-de-sac in a quiet town. One day, new neighbors, the Klopeks, mysteriously show up in a dilapidated house in the neighborhood. Their rare and odd appearances make our main characters curious, with the plot unraveling to reveal a potentially sinister threat. The film blends elements of comedy, mystery, with light horror elements, drawing you into its world from the opening scene. On the surface, it may appear to be a silly late 80s horror/comedy. After all, this is Joe Dante, who excels at blending horror elements with comedic elements (He did bring us Gremlins). Beyond this basic description, there is a lot going on in this film that makes it work. First, as the name suggests, much of the comedic elements, and indeed mysterious elements, play off notions of life in suburbia. The three main characters of Ray, Rumsfield, and Art work together as friends, with the reality of being neighbors providing the background. The whole notion of the importance of the neighborhood is continuously echoed by Ricky, played by Corey Feldman, with his constant, “God I love this neighborhood!” remarks. A lot of my love for this movie stems from nostalgia, from growing up in small town or suburban streets. Of course, I may be reading too deep, but I also detect the paranoia of Cold War otherness, manifesting in the suburban setting. With Cold War tensions easing and the fall of the Berlin wall a mere year after the film’s release, Cold War realities were dissipating, but still present. This is a strong theme throughout the picture, with the characters commenting and reacting to those who do not conform to the neighborhood’s ideals. Without spoiling the fantastic ending, a climatic speech by Tom Hanks’ character brings this notion full circle, by pondering who the real lunatics are: those who are different from the neighborhood or perhaps everyone else with their obsessions over manicured lawns, painted houses, etc. The characters in The Burbs, and their interactions, are where much of the humor comes into play. You have Ray (Tom Hanks), the “normal one of the bunch, whom we the audience identify with the most. Ray’s neighbor, Art (Rick Ducommun) is a socially unaware, sometimes buffoon character, who drives the paranoia surrounding the new neighbors. Finally, you have Rumsfield (Bruce Dern), who plays the somewhat crazy neighbor who helps Ray and Art hatch a scheme. I must say, Rumsfield is my favorite character, filled with the best one-liners and priceless facial expressions. He lingers between egging the other two on, and not taking anything seriously. The Rumsfield character plays for laughs, but underneath, we see an interesting phenomena reflected in both history and pop-culture. Part of the humor of this character is his over-the-top approach to everything, driven by the fact that he is a Vietnam Veteran. He is not portrayed as a traumatized soldier, searching for meaning in his return home, but rather these qualities are softened and merely hinted at beneath the surface. Ironically, this is a softer, comedic version of a similar role of a returning veteran, played by Dern, in the 1978 film Coming Home. The Burbs works on so many levels for me. It certainly takes the viewer back to a time when things were relatively calm, Vietnam was becoming more of a historical idea rather than a present reality, and the biggest issue was that the new neighbors were not conforming. Again, I feel in this review that I cannot do the film justice, just merely encourage you to check it out for yourself. The combination of humor, horror elements, and mystery will certainly keep you entertained. Before wrapping up this review, I do want to express one complaint, specifically with the home video formats. This movie is available on an older DVD from 1999. Besides that and a few “double” feature DVDs, The Burbs has unfortunately not seen an updated release. The video quality is lacking on the DVD, and aside from an alternate ending and trailer, no significant special features are present either. Personally, I would love to see an updated Blu-Ray release. Oh well, maybe someday. Thank you for reading, and get ready for the next installment of my Summer Film Series. Also, for convenience, I have included a trailer and a best of Rumsfield clip from YouTube. **WARNING** The second video contains a number of major spoilers. Please enjoy! This entry was posted in Movies and tagged 1989, 80s Movies, Bruce Dern, Burbs, Cold War, Comedy, Favorite Comedies, film, Joe Dante, movies, Rick Ducommun, Summer, The Burbs, Tom Hanks. Bookmark the permalink. Great pick. This is a fun movie and its sentiments are so true of suburbia.